Mississippi State remains ranked among the nation’s top 100 research institutions and the Magnolia State’s leading research university in a new report from the National Science Foundation. The recently released NSF Higher Education Research and Development Survey for Fiscal Year 2017 places the university at 94th overall among public and private institutions in the country, based on nearly $241 million in total research and development expenditures. It is ranked 58th among non-medical school institutions, and 64th among public institutions. The survey is the primary source of information about research and development expenditures at U.S. colleges and universities. It found that MSU research accounted for more than half of the expenditures reported by all Mississippi institutions in FY17. 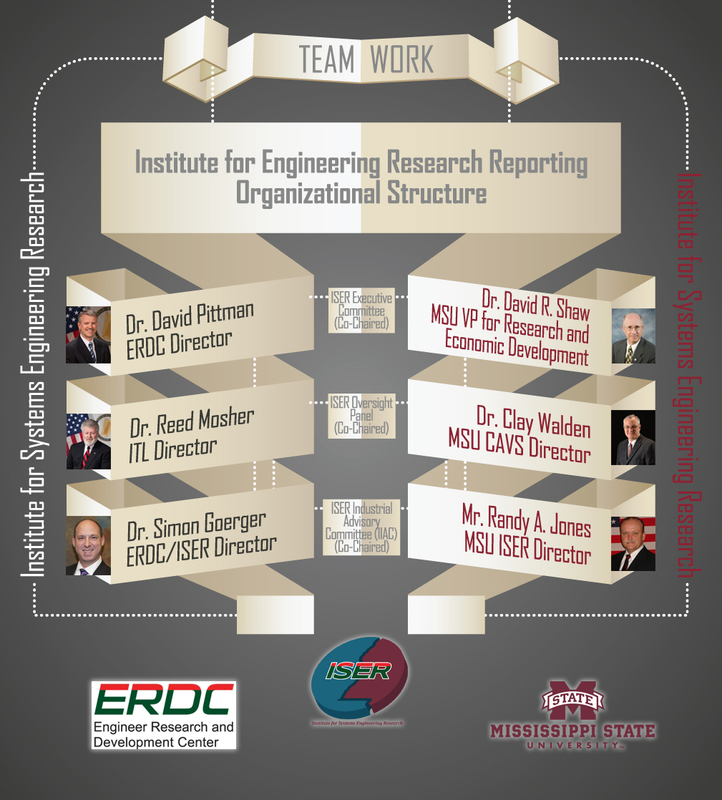 In addition to being the highest-ranked university in the state in overall R&D funding and federal funding, Mississippi State also has the largest total number of research personnel, including more than 600 principal investigators. MSU leads universities in the state in computer science, agricultural science, life science, mathematical sciences, psychology, social science and education. “We are very pleased to see our research portfolio growing and diversifying. It’s a true testament to the extraordinary people—the faculty, staff and students—we have here at MSU,” said David Shaw, vice president for research and economic development. The survey also affirms the 140-year-old land-grant institution’s commitment to the state’s $8-billion agriculture and forestry industry. Mississippi State’s $109 million in research and development expenditures in agricultural sciences and natural resources and conservation in FY 2017 places the university in the nation’s Top 10—a position it has held for the better part of two decades. “Mississippi State continues to be a national and international leader in research and outreach in agriculture, forestry and natural resources. We are discovering, developing and deploying innovative food, fiber and fuel solutions that are essential to our growing world,” said Greg Bohach, vice president of the Division of Agriculture, Forestry and Veterinary Medicine at MSU. For the sixth consecutive year, Mississippi State leads the Southeastern Conference in social sciences and is ranked 17th nationally with $34.6 million in expenditures. Three Bagley College of Engineering disciplines were rated in the top 50, including industrial at 33rd, mechanical at 25th and aerospace at 33rd. MSU also ranked 31st in the NSF’s “Other Engineering” subfield. The university climbed in geosciences, chemistry, agricultural sciences, mathematics, business and biological and biomedical sciences. "Mississippi State’s research funding comes from a wide range of sources, including business and industry, trade groups, and local governments, state offices and federal agencies, including the USDA, National Institutes of Health, Federal Aviation Administration, NASA, National Science Foundation and the Department of Defense, to name a few examples," Shaw said. 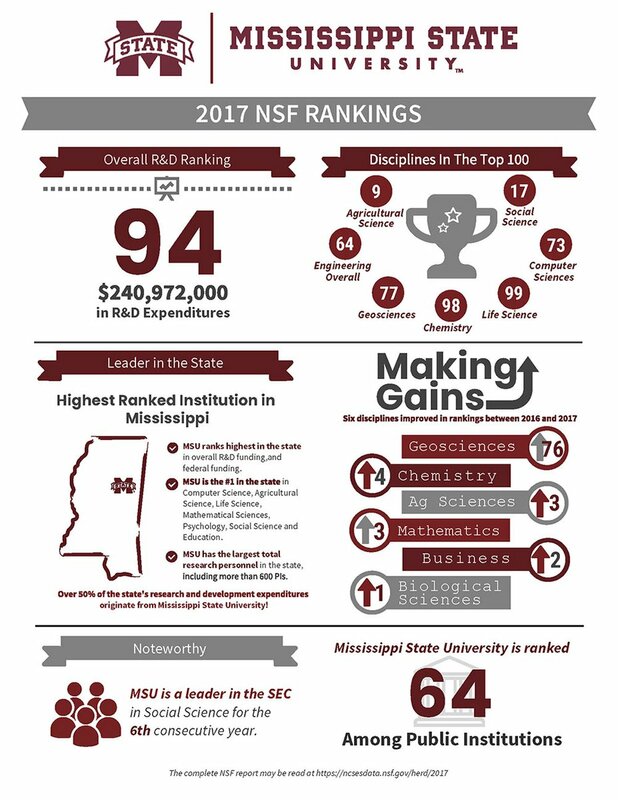 In addition to its high NSF status, Mississippi State is the only university in the state to achieve Innovation and Economic Prosperity University status from the Association of Public and Land-grant Universities and its Commission on Innovation, Competitiveness and Economic Prosperity. The designation—attained after a rigorous review process—recognizes Mississippi State for working to advance engagement and economic well-being in the state, region and nation. The complete NSF report may be read at https://ncsesdata.nsf.gov/herd/2017. Discover more about research at Mississippi State at www.research.msstate.edu and www.dafvm.msstate.edu.